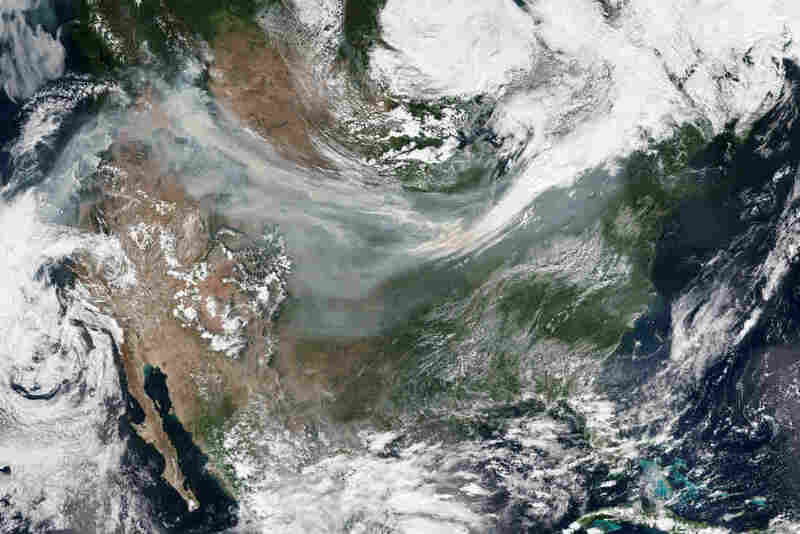 Smoke From Western Wildfires Can Make It Hard To Breathe : Shots - Health News Forest fires have brought a smoky haze to the West, along with stinging eyes, sore throats and headaches to people far from flames. Unseen particles of ash also make it hard for some to breathe. 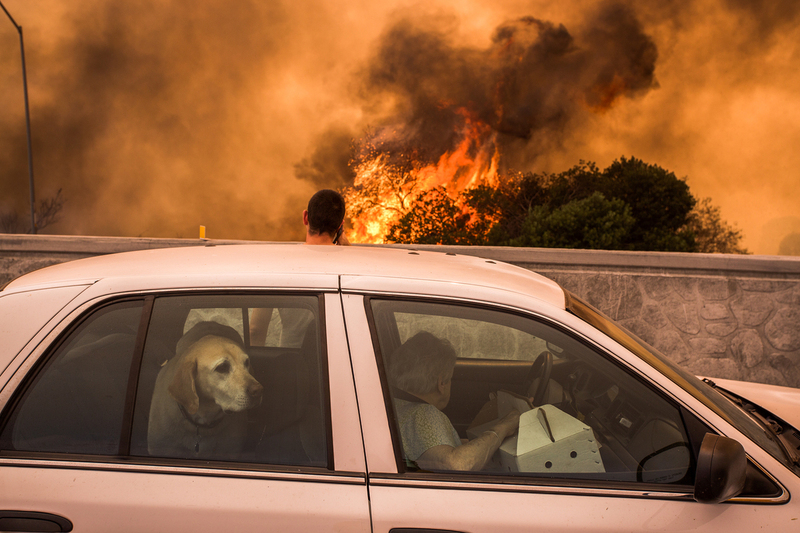 Residents of the community of Tujunga, Calif., flee a fire near Burbank on Sept. 2. Even people much farther from the flames are feeling health effects from acrid smoke. It's an unusually bad wild fire season in the West, and for weeks people across the region have been breathing air thick with smoke. "There's smoke from Canada, smoke from Idaho, smoke from California and Montana. There's smoke everywhere," says Greg Svelund, a spokesman for Oregon's Department of Environmental Quality. A quick look at the Environmental Protection Agency's Air Now website shows unhealthy or hazardous air conditions all over the Pacific Northwest and into Northern California, Idaho and Montana. "My lungs have been really sore. 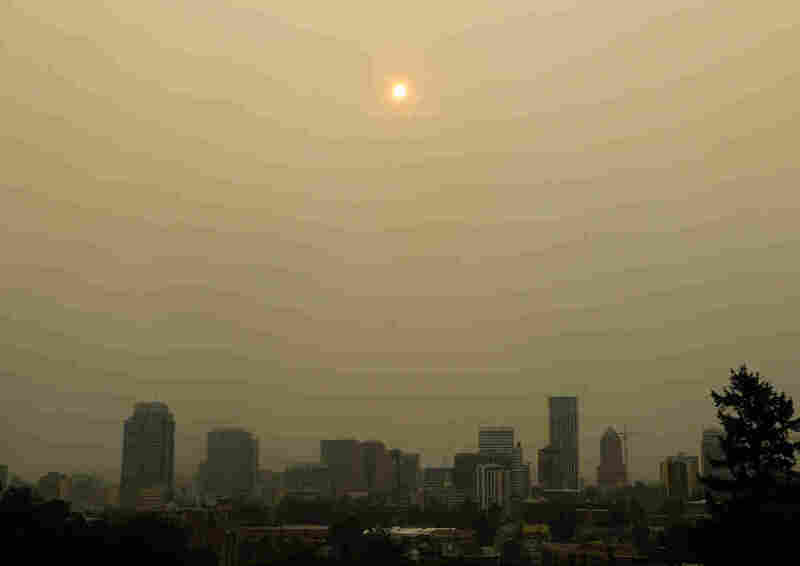 It's hard to breathe and it smells like we're in a campfire," says Tucker McClaran, who I found riding her bike in Portland, Ore. She's wearing what looks like a biker's face mask. "It's hot," she says. "It's chemically and it's gross." Will her face mask really help protect her lungs? And what are the long-term health risks of breathing this acrid, yellow air? To answer those and other health questions, I met up with Dr. Gopal Allada, a pulmonologist and critical care specialist at Oregon Health & Science University. We're on a balcony at the university hospital, overlooking the smoky city. "This haze represents a lot of ambient smoke particles and particulate that's burning from the trees and organic matter," Allada says. "It's hanging in the air and hitting our lungs, hitting our nose and causing problems." The falling flecks of ash get lodged in our eyes and nose and cause irritating symptoms like itchy eyes, sore throat, headaches — even a little nausea. But it's the fine particles — particulate matter that's 2.5 microns or less in diameter — that are the biggest health hazard. They're so small you can't see them. "This is not good for our lungs," Allada says. "When you inhale these really small particles, smaller than a few microns, they can land in your lungs and cause respiratory symptoms." They can even pass into your bloodstream. For most people, the risk of any serious complications, like chest pain, irregular heartbeat or even heart attack, is minimal. But for people who have underlying heart conditions or respiratory illnesses — such as asthma or chronic lung disease — exposure to wildfire smoke can be serious. Other high-risk groups include people over 65, children (whose lungs are still developing) and pregnant women, because of the risk to the fetus. The best way for everyone to minimize the risk when skies are smoky is to stay inside. "Close all windows and doors unless it's really hot," Allada says. "And use the recirculate button in your car or on your air conditioner, so you are not bringing in new particulate matter." If you don't have air conditioning, try spending some time in a library, mall, or community center that does, says Dr. Ann Thomas, a preventive medicine specialist with the Oregon Health Authority, which has published a pamphlet on the health effects of wildfire smoke. A standard dust mask that you can buy at the pharmacy won't do you much good, Thomas says. It may keep out the large pieces of ash, but it also may cause you to inhale more deeply, and it won't filter out the microscopic particles that can get into your lungs. An N95 mask can filter out 95 percent of smoke particles, but only if it's fitted properly and dirty air doesn't leak around the sides. If you are at high risk, you might want to invest in a high-efficiency particle arresting (HEPA) air filter, which costs around $50 to $300. And when air conditions are bad, avoid burning candles, frying meat, even vacuuming, which can all add more tiny particles to the air. And drink lots of water. The fluid keeps your eyes, nose and throat moist, which can help alleviate irritation.